Ric Flair continues to broadcast the best podcasts in the business. Flair recently had on former WWE and TNA executive Bruce Prichard and the two gave a fascinating critique of Dixie Carter and the business of TNA Wrestling. I can’t say it enough. Flair is killing it on his podcasts, so much that I find myself getting excited every week when a new one gets posted. What makes Flair different than all of the other pro wrestler gone podcasters is that Flair has conversations with his guests. Flair doesn’t just as questions, Flair has conversations, offers anecdotes, and reminisces in a way that you feel as if you are eavesdropping on him and his guest at dinner. That is what makes every Flair podcast so much fun to listen to (and his weekly anti-marriage rants). 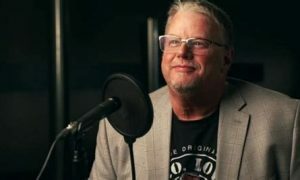 Former WWE and TNA Wrestling producer Bruce Prichard was a recent guest on WOOOOO! Nation with Ric Flair and while they discussed a variety of topics and told a lot of great stories, it was their discussion on TNA that I found most fascinating. The two pulled the curtain back on what it’s like to work in TNA from a talent and producer’s perspective, specifically the frustrations working with TNA president Dixie Carter. 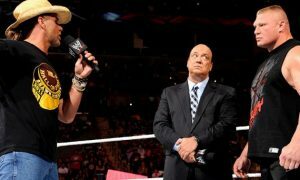 The two offered an intriguing analysis of TNA and the root of its problems. From listening to Flair and Prichard it starts at the top with Dixie and the owners of the company. Listening to Prichard and Flair’s reflections on their times in TNA help make sense of TNA’s steep decline in recent years. 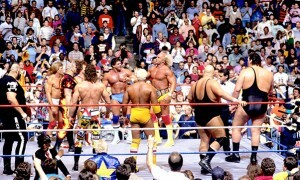 Ric Flair: You’d have to admit it was rough there, holy cow! Bruce Prichard: It was rough because unfortunately you didnt have the backing and you didnt have the tools to turn it around. You had the talent. You had the knowledge. Ric: One of the most difficult things for me was as nice as she is and she is a nice person, Dixie’s (Carter) communication to the talent and what was actually going on was just light years apart from what was really taking place. Would you agree with that Bruce? Bruce: Oh whole heartedly, it was rough. Ric: Bruce could tell somebody something in that role, the role that I’ve worked under and it should be like this is the bottom line, that’s it. But then Bruce had to deal with Hulk (Hogan) and on came Eric (Bischoff) and in came (Vince) Russo and Bruce has got all of this to deal with and then he’s got Dixie out in the parking lot and I don’t know why to this day she likes to pull the talent aside or the talent will pull her aside whichever way it goes, and they’ll make a deal with her and of course she doesn’t relay it to Bruce (laughs). “Well Dixie told me this,” I’ve been through that with her, you know what I mean? It’s just strange. It’s not malicious, it’s just a very difficult way to do business after you’ve been in the professional atmosphere of the WWE. Is that a fair statement? Bruce: Yeah, that’s fair. You really just summed it up. It was difficult to do your job. After you would put something into motion, something else would be put into motion and you never even knew about it until it was way after the fact or too late. I’m sitting there going, “Um what’s this?” (Dixie)”I talked to him, don’t worry about it.” Don’t worry about it? Conrad Thompson: Bruce, do you have an example of a story like that? Bruce: Unfortunately there were too many to even remember but a lot of times there were things that, to sum it all up out of let’s say out of 50 talent on the roster you had, well when I started there were seven or eight different versions of contracts. They were all completely different. There were instances where talent was guaranteed 150 dates, but they were only able to work 70 because they only ran 70 events yet they’ve got a contract for 150. There were just so many things like that unfortunately there were different people at different times in that position that things got grandfathered in and the right hand a lot of times didn’t know what the left hand was doing and people would just go into business for themselves. 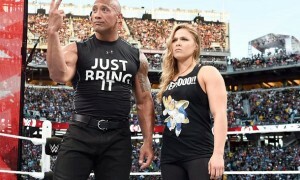 And it was challenging to deal with an office in Dallas, Texas that’s an energy company that builds power plants and that doesn’t understand the wrestling business or the entertainment business. That doesn’t understand the nuances. To them an independent contractor is a plumber so one independent contractor is gone it’s just replacing another. That’s not how you do it with talent. They may be independent contractors but they’re talent. Ric Flair goes, I can’t just replace him with an independent contractor and have the same thing. There is more talk about TNA, specifically both pontificating about Jeff Jarrett’s return the company as well as plenty of stories about working together in the WWE. It’s another fantastic podcast and I’d recommend checking out the entire thing over at the WOOOOO! Nation with Ric Flair page.